On November 1, Evgenia Kouniaki stepped off an electric bus and headed towards the courthouse when she saw a mob of black-clad Golden Dawn members running in her direction. “I’m sure that I was attacked because I told them to stop … and I’m sure the fascist members of Golden Dawn recognised me from the court,” said Kouniaki, who is part of a legal team for a group of Egyptian fishermen attacked by a Golden Dawn squad in Perama, an area near Athens, in 2012. “I saw they were trying to enter the [bus] to find a man … after a while, they started to enter, and I started to yell ‘stop, stop’,” she told Al Jazeera. Although Kouniaki was puzzled by the attack – she did not hear the man provoke the far-rightists and he did not subsequently speak out in the media – she has since concluded that they “wanted to send a message”. Kouniaki recognised her attackers as members of Golden Dawn’s Piraeus branch; she has since filed a complaint. By the time of publication, the Greek police had not replied to Al Jazeera’s request for a comment. In a statement published the following day, Golden Dawn leader Nikolaos Michaloliakos said he “strongly condemn[s] every act of violence” without referencing the attack on Kouniaki. 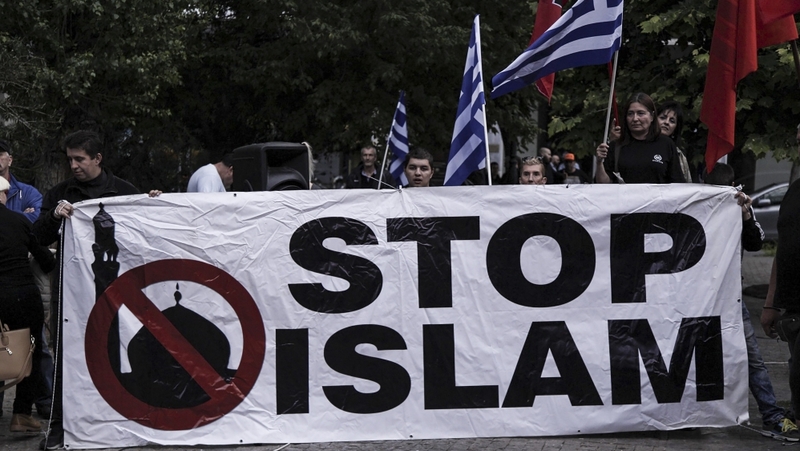 On November 26, a group of Greek football fans attacked Pakistani immigrants as they celebrated the birth of Prophet Muhammad in central Athens’ Omonia Square. Police fired tear gas and sound grenades to disperse the crowd. A neo-Nazi vigilante organisation calling itself Crypteia, a reference to a group of ancient Spartans infamous for attacking slaves, claimed responsibility for the attack on the boy’s home. The attack is suspected to be retribution for an anti-fascist action that saw masked anarchists smash the windows of the party’s main headquarters earlier that day, though there has been no indication that Lazaras had any connection to that incident. “As long as there is no alternative from the left, I wouldn’t be surprised if the Golden Dawn sought to fill the void. We’ve been seeing it all over Europe,” he said. Seferiades said Syriza’s about-face “has created a gap, and any demagogue who comes along and is backed up by considerable resources could fill that role”. Thanasis Kampagiannis, a lawyer in the Golden Dawn trial, has monitored the far-right organisation and others like it for years. 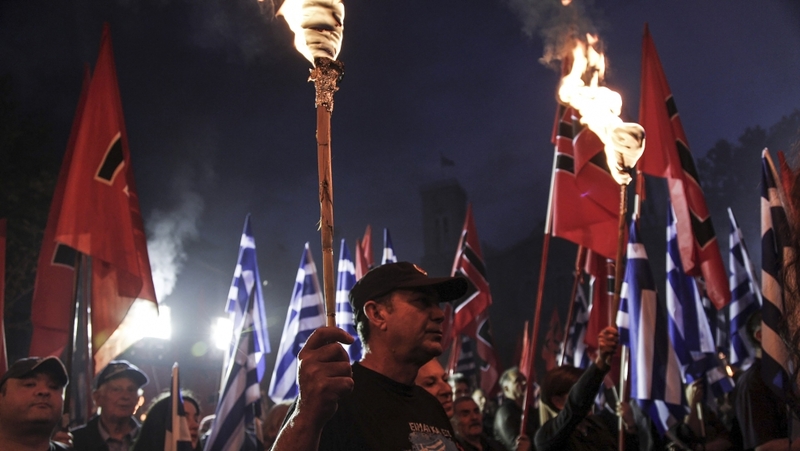 “Golden Dawn is a neo-Nazi organisation, and it models itself off Hitler’s battalions,” he told Al Jazeera. “The number of attacks decreasing is beyond doubt… and this shows that the racist attacks we experienced in 2012 and 2013 were organised by Golden Dawn,” he argued. “I was shocked because the reality is that I didn’t believe it could happen outside of the court where they are on trial,” she said. Η Μαρία Γιαννακάκη απαξίωσε να απαντήσει στην ακόλουθη επιστολή (που προτοκλλήθκε από τη γραμματεία της με Αριθμό Πρωτοκόλλου 318-24/04/2017 και η Ελλάδα συνεχίζει να περιφρονεί την υποχρέωσή της να αποζημιώσει τους Ρομά θύματα αστυνομικής βίας και έξωσης σε εκτέλεση καταδικαστικών αποφάσεων του ΟΗΕ. Σας αποστέλλουμε συνημμένα τις τρεις αποφάσεις («Διαπιστώσεις») της Επιτροπής Ανθρώπινων Δικαιωμάτων ΟΗΕ στις προσφυγές Ρομά Κατσαρής κατά Ελλάδας, Καλαμιώτης κατά Ελλάδας και οικογένεια Γεωργόπουλου κατά Ελλάδας. Μετά τη διαπίστωση παραβιάσεων του Συμφώνου η Επιτροπή ζήτησε από την Ελλάδα να χορηγήσει «ικανοποιητική αποζημίωση» στα ζημιωθέντα άτομα, καθώς, όπως γνωρίζετε, αντίθετα με το ΕΔΔΑ, δεν έχει συμβατική αρμοδιότητα να καθορίζει το ύψος αυτών των αποζημιώσεων. Ζήτησε επίσης «να δημοσιεύσει τις Διαπιστώσεις». Δυστυχώς, οι προηγούμενες κυβερνήσεις, προβάλλοντας απαράδεκτους προσχηματικούς λόγους, αρνούνταν να συμφωνήσουν στη χορήγηση αποζημιώσεων οι οποίες είχαμε προτείνει να είναι ανάλογες με εκείνες που έχει περιλάβει το ΕΔΔΑ σε αντίστοιχες αποφάσεις. Παράλληλα, οι Διαπιστώσεις για τις προσφυγές αυτές (όπως και για άλλες στο ίδιο όργανο) δεν υπάρχουν πουθενά δημοσιευμένες. Γνωρίζοντας τις ευαισθησίες σας στα θέματα της εκτέλεσης των διεθνών (ημι-)δικαστικών αποφάσεων καθώς στα δικαιώματα των Ρομά (τους δύο από τους οποίους –Κατσαρή και Καλαμιώτη- κατοίκους του καταυλισμού Χαλανδρίου έχετε άλλωστε άμεσα υποστηρίξει και ενώπιον της δικαιοσύνης), παρακαλούμε να κάνετε τις απαραίτητες ενέργειες ώστε να χορηγηθούν «ικανοποιητικές αποζημιώσεις» για το ύψος των οποίων είμαστε σίγουροι πως εύκολα θα συμφωνήσουμε. Επίσης, παρακαλούμε να φροντίσετε για άμεση δημοσίευση των Διαπιστώσεων από το Νομικό Συμβούλιο του Κράτους (όπως έκανε στο παρελθόν αλλά στη συνέχεια σταμάτησε να το κάνει) ή/και από τον ιστότοπο του Υπουργείου Δικαιοσύνης. Προκειμένου να ενημερώσουμε την Επιτροπή Ανθρώπινων Δικαιωμάτων ΟΗΕ παρακαλούμε να έχουμε την απάντησή σας μέχρι τις 30 Μαΐου 2017. Greece’s failure to execute the ECtHR judgments finding violations of the freedom of association of three ethnic Turkish and one ethnic Macedonian associations reflects the fact that Greece is the only European country whose administrative and judicial authorities do not recognize (or even simply acknowledge) the existence of the ethno-national (Turkish and Macedonian) minorities. If these associations, or other Turkish or Macedonian associations, (re-)register as a measure of execution of these judgments, this will be tantamount to a recognition (or acknowledgment) of the existence of these two ethno-national (Turkish and Macedonian) minorities, and hence of reversal of Greek policy. Additionally, in the September 2017 judgment for the House of Macedonian Civilization, the domestic court argued that the ECtHR judgments do not penetrate the Greek legal order and hence cannot annul the domestic court judgments. It added that the previous domestic judgments were issued not only because the aims of the association were a threat to public order and security but also “to protect the rights and freedoms of others, protected by Article 8 ECHR,” which rights, the Florina court claimed, were not taken into consideration by the ECtHR. The Florina court finally stated that the situation concerns a sensitive issue of cultural identity and is thus similar to the ban to wear the burqua that the ECtHR upheld in S.A.S. v. France. The CM is requested to note that the Greek Government did not comment on the 16 September 2017 GHM submission on these cases and has to date not commented on the subsequent 5 November 2017 GHM submission, where the aforementioned arguments were first made by GHM. Great emphasis was put by Greece on the amendments allowing the reopening of the cases adjudicated by the ECtHR adopted by Parliament on 13 October 2017. In fact, of greater importance for that examination is the debate that preceded the adoption and the addition to those amendments of clauses that practically exclude the reopening of the cases on the associations of the ethno-national (Turksih and Macedonian) minorities after successful ECtHR judgments. The CM is requested to compare the texts of the amendments finally adopted by the Greek Parliament on 13 October 2017 as submitted on 23 October 2017 to the CM by the Greek Government with the amendments initially tabled before the Greek Parliament but withdrawn because of widespread opposition as submitted on 11 September 2017 to the CM by the Greek Government. In the initial amendments, the admissibility of an application of revocation or amendment following an ECtHR judgment was binding for the domestic courts, which then had to examine the merits of the application. In the finally adopted legislative provisions, the admissibility of an application of revocation or amendment following an ECtHR judgment to be issued in the future is no longer binding but is “subject to the terms and restrictions provided in the relevant provisions of ECHR concerning the protection of national security, public order, the prevention of crime, the protection of health or morals and the protection of rights and freedoms of others.” Additionally, for ECtHR judgments issued in the past, such application has to also satisfy “the restrictions of article 11 par. 2. of the ECHR and the other provisions of ECHR, as well as international conventions.” [sic – they mean international treaties (συνθήκες) and imply the Treaty of Lausanne]. During the parliamentary debate, it had become clear that, except for the senior government partner SYRIZA, no other party was willing to vote for the initially tabled amendments unless the restrictions mentioned above were added. Then all major non-extremist political parties voted in favour of the amendments with the notable and historical first ever dissent from the party lines by all four “Muslim” (i.e. Turkish) minority MPs who voted against the amendments because they considered them ostensible pretexts. The CM is aware that the restrictions introduced by the Greek legislator had been taken into consideration by the ECtHR when the latter issued the five judgments for the three Turkish and, twice, for the one Macedonian associations. The ECtHR had then rejected these restrictions which were included in the Greek Government’s observations. Now the Greek Government and the Greek Parliament introduced them in the legislation on the possible re-examination of these cases so that domestic courts, in addition to their persistent refusal to register Turkish and Macedonian minority associations, are empowered with a legal provision to consider inadmissible such applications for revocation. The CM is urged to conclude that, on the contrary, this development of the legislation does not respond to the demands of the CM as it effectively does not allow the re-examination by the Greek courts of the applications for registration of the applicants’ associations. The CM is also requested to recall that the Greek Government has failed to execute for 20 years the House of Macedonian Civilization judgments and for 10 years the three Turkish associations judgments in the Bekir Ousta group of cases. The CM is also requested to recall that 2 years ago the ECtHR decided not to examine new applications by the three Turkish associations as long as the CM is examining the (non-)execution of the corresponding 2008 judgments. Finally, the CM should take into consideration that during that 20-year period, several UN Treaty Bodies and Council of Europe institutions like the Commissioner for Human Rights and Parliamentary Assembly of the Council of Europe have issued recommendations asking Greece to register these minority associations and/or recognize the corresponding ethnic Turkish and Macedonian minorities: Greece has opted to ignore all these recommendations. serve formal notice on Greece of its intention, at a future meeting in 2018, to issue an interim resolution that Greece has failed to fulfil its obligation under Article 46§1 by non-registering these five minority associations, which is an indication of violation of Article 18 ECHR, in which resolution the CM will recommend appropriate actions. (Athens, November 22, 2017) – The Greek government, with the support of EU member states, should act now to end Greece’s “containment policy,” 20 human rights and aid groups said today. The policy forces asylum seekers arriving on the Greek islands to remain in overcrowded, unsafe facilities, an urgent concern with winter approaching. Refugee tents next to the Moria hotspot on Lesbos island, where thousands of people, including very young children, pregnant women, and people with disabilities, are trapped in abysmal conditions as winter sets in. © September 2017 Emina Cerimovic. Σκηνές προσφύγων δίπλα στο hotspot της Μόριας στη Λέσβο, όπου χιλιάδες άτομα, περιλαμβανόμενων πολύ μικρών παιδιών, έγγυων γυναικών, και ατόμων με αναπηρίες είναι παγιδευμένοι σε τρισάθλιες συνθήκες καθώς έρχεται ο χειμώνας © Σεπτέμβριος 2017 Emina Cerimovic. « Τίποτα δεν δικαιολογεί τoν εγκλωβισμό ανθρώπων σε αυτές τις άθλιες συνθήκες στα νησιά, για άλλον έναν χειμώνα», επισήμανε η Eva Cossé, ερευνήτρια για την Ελλάδα στη Human Rights Watch. «Η Ελλάδα και τα υπόλοιπα Κράτη Μέλη της Ευρωπαϊκής Ένωσης οφείλουν να δράσουν επειγόντως εξαλείφοντας κάθε εμπόδιο που δεν επιτρέπει στους ανθρώπους να λάβουν τη φροντίδα και τη βοήθεια που χρειάζονται στην ηπειρωτική Ελλάδα». Οι οργανώσεις καλούν τον Πρωθυπουργό Αλέξη Τσίπρα να προστατεύσει τα ανθρώπινα δικαιώματα των αιτούντων άσυλο που βρίσκονται εγκλωβισμένοι στα νησιά θέτοντας τέλος στην πολιτική περιορισμού, μεταφέροντας άμεσα ανθρώπους σε βελτιωμένες συνθήκες στην ηπειρωτική χώρα, και αναλαμβάνοντας τη δέσμευση να διασφαλίσει ότι κανείς δεν θα εξαναγκαστεί να διανυκτερεύσει σε αντίσκηνο. Καθώς η «πολιτική εγκλωβισμού» εφαρμόζεται στο πλαίσιο της Συμφωνίας ΕΕ-Τουρκίας, οι οργανώσεις τονίζουν την ευθύνη της Ευρωπαϊκής Επιτροπής και των κρατών-μελών της ΕΕ να αντιμετωπίσουν την κατάσταση στα ελληνικά νησιά και να ασκήσουν πίεση προς την Ελληνική Κυβέρνηση για την ανατροπή της πολιτικής περιορισμού. Τα κράτη-μέλη της ΕΕ θα πρέπει να συνδράμουν την Ελληνική Κυβέρνηση στην προσπάθειά της να εξασφαλίσει την ασφάλεια και την αξιοπρέπεια των αιτούντων άσυλο στο έδαφος της ΕΕ, μέσα και από την επέκταση ασφαλών συνθηκών διαμονής και πρόσβασης στις υπηρεσίες, στην ηπειρωτική χώρα.